Today, I’m featuring a museum. When is a museum not a museum? When it’s The City Museum. Now then, for those of you who didn’t really want to watch a 7-minute video of a random family (mine) enjoying this super cool museum, I’ll give you the verbal and pictorial version. Of course, you can go to the website and see the list of cool attractions like enchanted caves, Art City, Toddler Town, MonstroCity, and more, but what you need to hear from me is that this place is seriously amazing. Much more than you can tell even from their website. I mean, it’s the home of The World’s Largest Pencil, for cryin’ out loud! There are all kinds of cool things to do. We especially enjoyed the 7-story slide (and, yes, you have to climb up 7 stories before going down) and the less-imposing 3-story slide to which it is much easier to gain access, but it’s really the ambiance the museum provides that makes it worthy of your time – it’s cool retro meets hip modern meets urban crunchy-let’s-recycle-everything-in-sight. 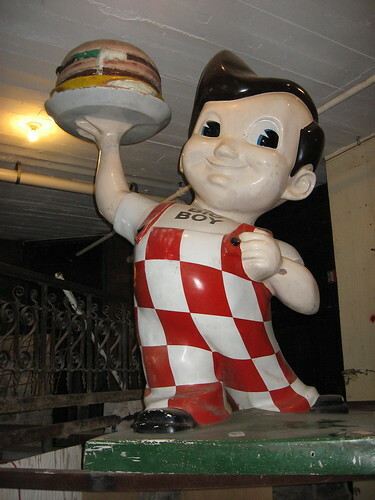 I especially love the statue of Kip’s Big Boy, which I have permanently stored in my memory as a kid growing up in Tulsa. The creators of the City Museum have taken all kinds of pieces of leftover sculpture and architecture and installed them in creative ways, both to enjoy kinesthetically as well as appreciate visually. It’s a complete melding-of-the-senses kind of experience. There is a pretty awesome outdoor play area with all kinds of climbing structures, slides, ball pits and more. 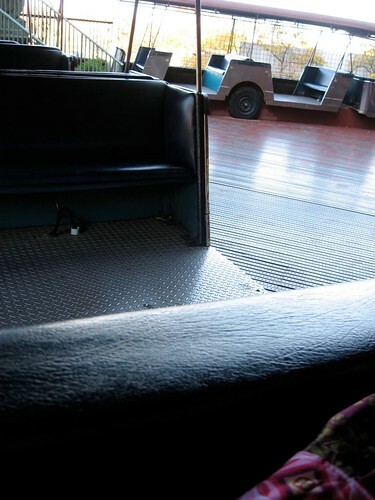 They installed an old amusement park tram for random seating, which is just all kinds of cool in my estimation. I mean, what else could you possibly do with an old amusement park tram? Most of the stuff you see here would have made its way to a landfill somewhere, but instead it has been given a second life at the City Museum and it really works well. 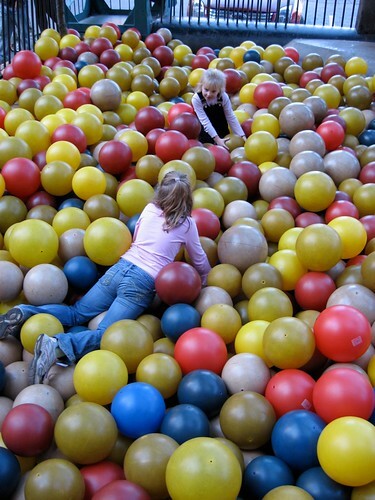 Ball pits have all but vanished in most play places around the country but there is still something super cool about a ball pit. There are two here, divided for younger kids and older kids. The day we went, we had one of the staff members spend 30 minutes beaning my older girls with balls from 1 story above and they HAD THE BEST TIME WITH THAT. The World Aquarium is also part of The City Museum, but it requires a separate admission ticket. They do have a tank of a few miscellaneous sea creatures you can see without paying for the World Aquarium, so as of yet, we haven’t paid that extra fee. Now then, for the details you’ve all been waiting for: how much does it cost? 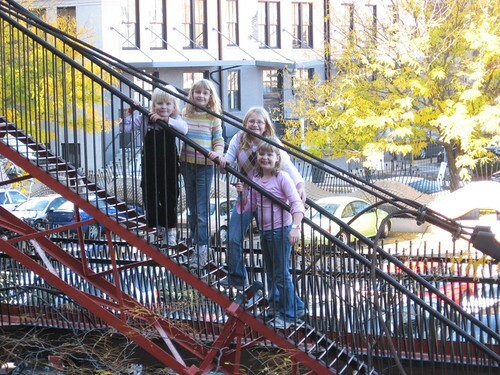 The City Museum costs $12 and tickets are required for everyone age 3 and above. Granted, $12/person is a lot of money to shell out for a fun family outing. We’ve been two times so far and did not pay full price either time. The first time we went we tagged onto a field trip sponsored by a non-profit group (ticket prices for non-profit groups are only $6 each, but you have to have a minimum of 15 people and show proof of non-profit status to get this rate). A second way to get a cheaper rate (but without having to go as one large group) is to purchase tickets in bulk. You can buy group tickets (again, minimum of 15) that do not have to be used at the same time. They cost $8 each and expire one year from when they are purchased. So the second time I bought tickets, I found a few friends who also wanted a deal to the City Museum. I arranged the purchase and distributed the tickets to them. My family kept 6 and we ended up not going for another 10 months (the trip shown above is the one for which we used our discount group tickets). Now then, that ticket price does not include roof-top admission, which is another $5/person. We’ve never been to the roof and probably will never go as a whole family. The World Aquarium can be added on to your City Museum ticket for an additional $6/person. We may do that at some point in the future, but it will not be something we do every time we go. The word on the street is that Friday nights get pretty rowdy in there; it’s more of a teenage/young urban professional hang out during that time. 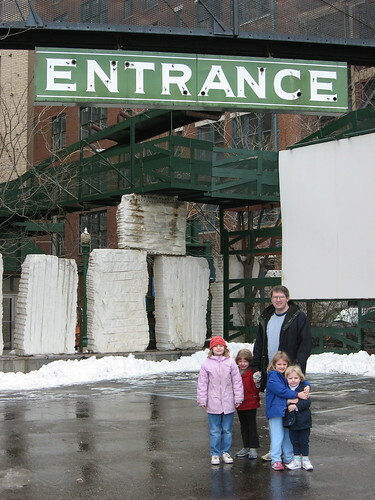 So if you are planning to take your family to The City Museum, you might want to stick with daylight hours. Also, this is one place I’ve decided never to go alone; it’s fun, but it can be overwhelming. With Craig along, though, it is really super fun for all of us. Craig isn’t really a kids’ museum kind of guy, but this is the one kids’ field trip he enjoys. Quick! Where can I find some Rockies and Ropers? Wow, Megan, that looks fun! Too bad it opened up two years after we moved from St. Louis. I was always impressed by the amount of stuff there was to do in St. Louis. 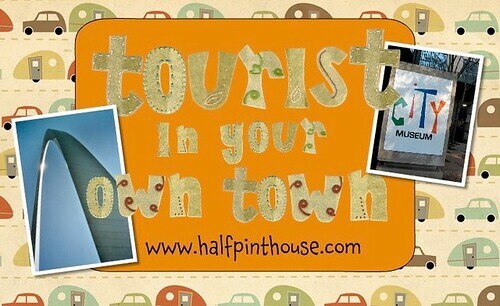 I am looking forward to the rest of your “Tourist in your Home Town” posts….memories! I absolutely LOVE the City Museum! I’ve been there once or twice with friends on a Friday night and it does become more of a grown up hang out. But we have the right to be kids again, too, right? This sounds amazing! If we are ever that direction, we will check it out. I’m glad I read this. We have been deciding if we should take our 5 year old there. I have heard it’s mostly for older kids. What is your thought on that? Should we wait another year or two? I’m also bummed that it costs more to get into the Aquarium, that’s another reason we haven’t gone. Your 5yo will have a BLAST here with you. They have a section for younger kids that a 5yo will love, but he(she?) will also enjoy the tunnels and slides and you can do it all with him. The first time we went our kids were 8, 7, 6, 4 and we still all really enjoyed it. The last time they were 11, 9, 8, 6.